"One week clean! Then a whole lifetime…" Netflix has released an official trailer for a documentary titled Recovery Boys, the latest from filmmaker Elaine McMillion Sheldon (Lincoln County Massacre, Hollow: An Interactive Documentary, 11/8/16). This just premiered at the Hot Docs festival last month, and will be available on Netflix at the end of this month. "In the heart of America's opioid epidemic, four men attempt to reinvent their lives and reenter society sober after years of drug abuse." The doc film is an "intimate look at the strength, brotherhood, and courage that it takes to overcome addiction and lays bare the internal conflict of recovery and the external hurdles of an unforgiving society." The opioid epidemic is a hot topic in American society right now, and these real stories are important because they actually provide a bit of hope and optimism in a world that doesn't seem to have much of that recently. This looks like it's worth watching. In the heart of America's opioid epidemic, four men attempt to reinvent their lives and reenter society after years of drug abuse. Academy Award-nominated director Elaine McMillion Sheldon (Heroin(e)), returns to her native West Virginia for her feature film debut. Recovery Boys is an intimate look at the strength, brotherhood, and courage it takes to overcome addiction and lays bare the internal conflict of recovery. In an effort to break the cycle of generational addiction and trauma, four young men let go of painful pasts as they live in the present and build a new community in a farming-based rehab. After rehab, they experience life's trials and tribulations sober but struggle to find their place and purpose in an often-unforgiving society. In today’s world, where shocking statistics about the opioid crisis make headlines daily, Recovery Boys offers a deeply personal look into the unseen lives of those working toward transformation. Recovery Boys is directed by filmmaker Elaine McMillion Sheldon, of the docs Lincoln County Massacre, Hollow: An Interactive Documentary, and 11/8/16 previously. It just premiered at Hot Docs this year. 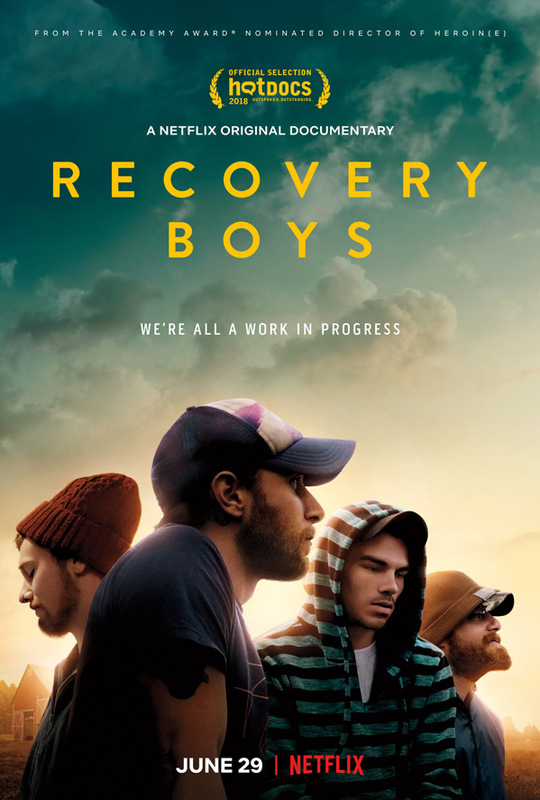 Netflix will release Recovery Boys streaming exclusively starting on June 29th this month.